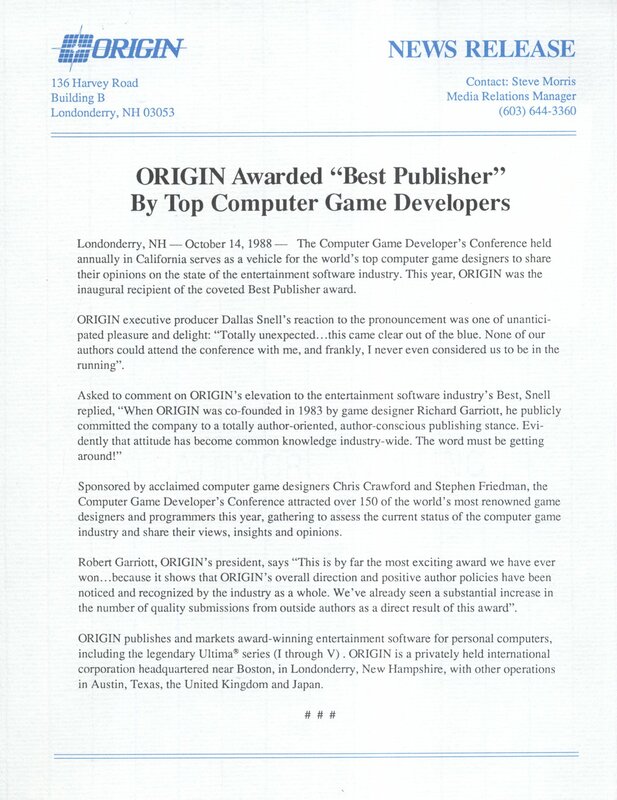 Chris Launius has posted a large number of photos of the original artwork for various Origin games on Facebook. 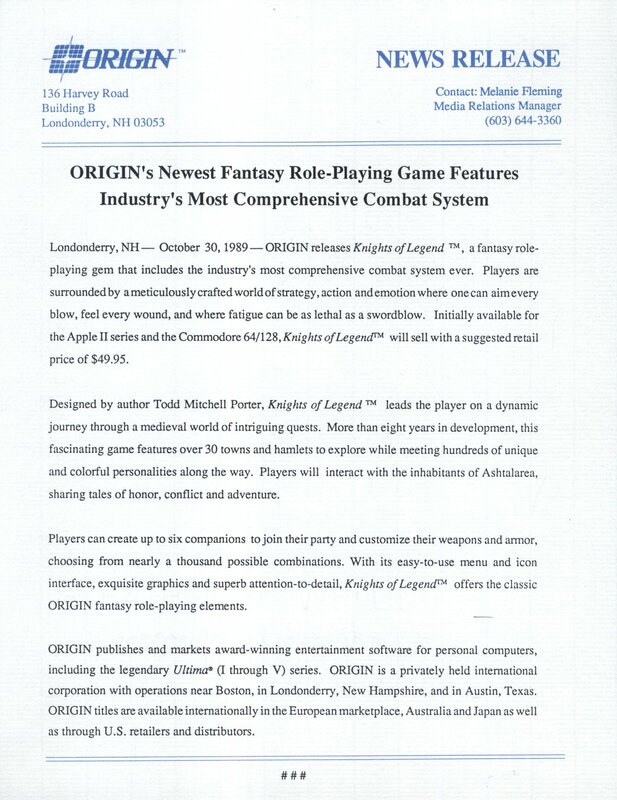 I’d normally leave news like this for other sites but this is too good to pass up with the cover art for Ring Quest, the Times Of Lore map, Ultima 5, Ultima 1 and many others. One of the most interesting items is a hand-drawn box art mockup for Knights Of Legend which is very different to the final version. Head on over to Chris’s Facebook album to have a look at the rest. If that isn’t enough, he’s also got an older archive with drawings from Martian Dreams, Quest For Clues books and some early drawings of the Ultima 5 cover. Chris apparently saved all of this stuff and much more when it was going to be thrown out after Origin were closed down. All of it going into landfill is unthinkable but this sort of thing is hardly an uncommon story. Good to know it’s all in safe hands now although I inevitably wish they were mine. On those lines, I agreed to buy most of the remainder of Rhea Shelley’s hoard of Origin memorabilia a couple of nights back. There isn’t so much left now so it’s not quite the bank account crippling expense of last time but it’s enough that I’m certainly going to notice it. There isn’t much documentation but there are some cool Origin nik-naks which I had to have. Expect photos in due course but I’m not even close to going through everything I got the first time around yet. If anyone wants a Crusader poster by the way, I should soon have far more than I could ever need. 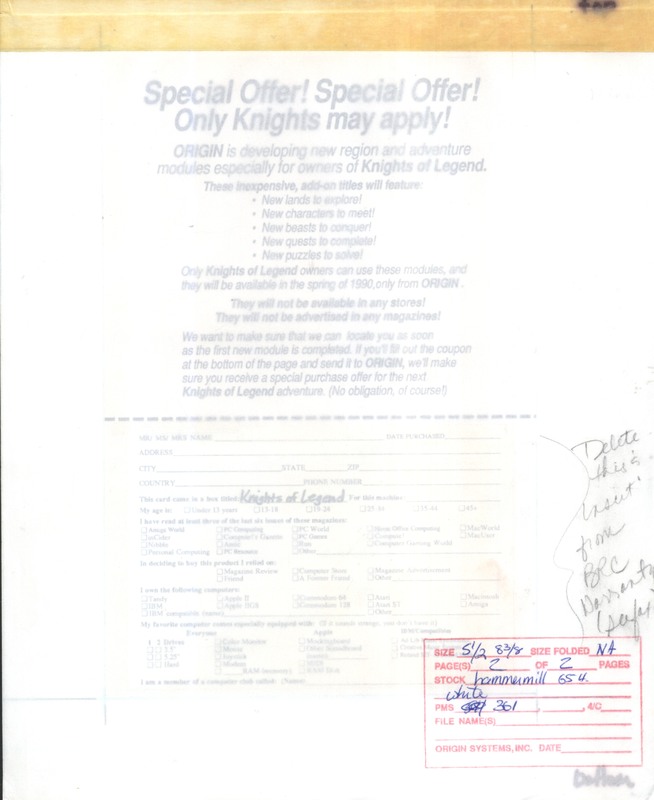 This is the design board for a Knights Of Legend flyer which I assume was included with the game, although there isn’t anything comparable in my copy. 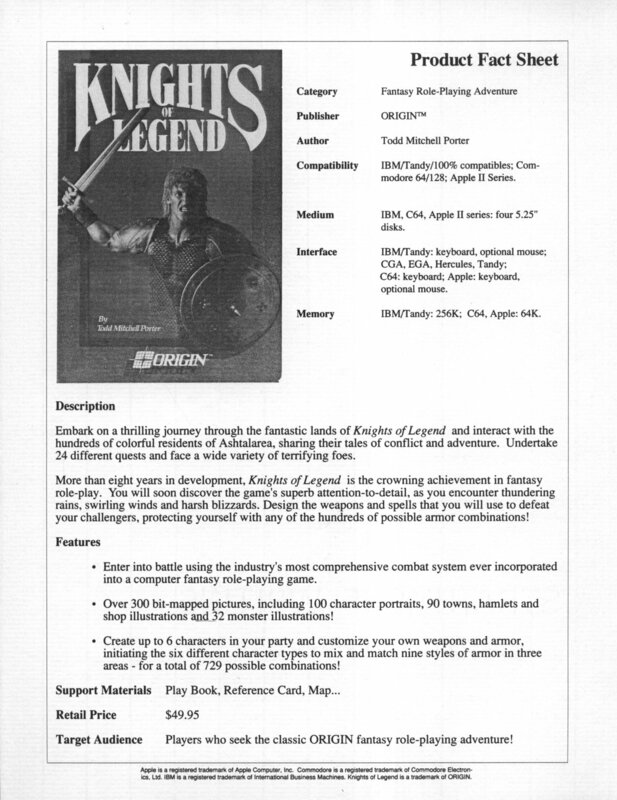 The original plan with Knights of Legend was to release a long series of add-on packs which would have essentially been sequels using the same engine. This should have made it the first Origin game to have an expansion pack but no add-ons were ever released presumably due to disappointing sales of the game. It’s a final couple of scans from Games Machine magazine today. 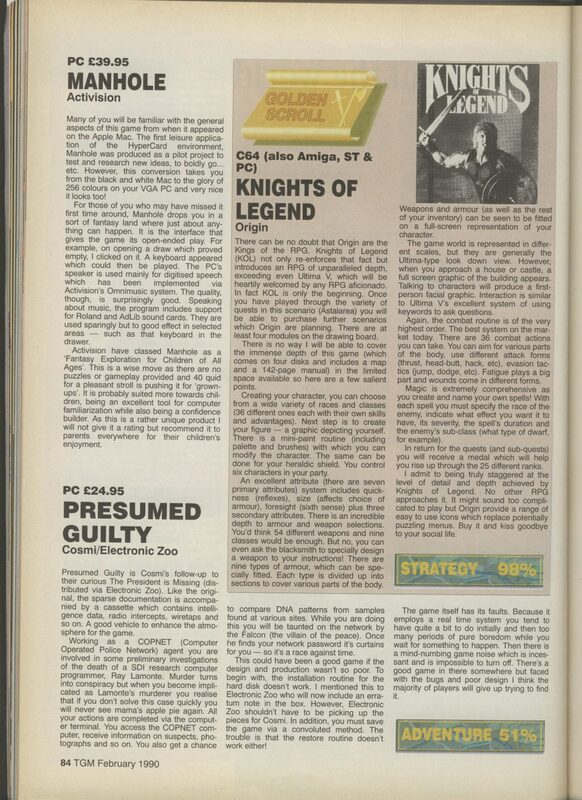 The first is a review for Knights Of Legend on C64 from February 1990. Anyone who read the early stages of this blog will know what I feel about Knights Of Legend. I did a review on Mobygames for which my one line summary was “Gaming Hell”. It’s a game that could have been designed to frustrate someone trying to blog their way through dozens of titles by stalling them for a year or two and it’s the only game that I had to resort to cheating (savestates not included). The magazine review is more positive to say the least and it’s awarded the staggering score of 98%. It does warn that you will have to say goodbye to your social life but as far as I’m concerned you couldn’t hold down a job either and have the time needed to play this game. There was still plenty to like about it though if you are prepared to put the time in and have the patience required. Knights Of Legend would probably be my choice for a desert island game for all the reasons that I disliked it. This is apparently my 500th post on here. 500 posts and I still haven’t played Lazarus or sorted out the site navigation/appearance for that matter. The latter is unlikely to happen any time soon but I don’t think I’ll make it to the end of the year without playing Lazarus. I’ve added 3 new downloads in the Origin books section. I wasn’t happy with some of the cluebook scans on replacementdocs especially Martian Dreams which was horribly overcompressed during editing. I’ve redone that, Savage Empire and Underworld 2. I had a long session on KOL and managed to finish it off today. Again I’m not going to go into detail, the format was pretty much the same as everything that went before. In some ways the game grew on me a bit, the quests got more elaborate with it gettting harder to chase down the information needed from the townspeople. Take away the awful combat system and this game could potentially have been good. Since you will be spending 95% of your time in the combat though its utterly ruined. Some of the quests would have been even more painful without the cheating. One of them is a giant maze where your party is split up at the start. Whoever designed that must have been a masochist if they thought that was going to be entertaining. I can’t say I got any real feeling of a plot throughout the game – there is some sort of vague storyline for the quests but it doesn’t really contribute to any overall plot and at the end of the game you free segallion and thats it. The fact I was cheating utterly and rushing through meant I missed stuff out but I’m pretty sure I didn’t miss a lot. At the end of the game you free Segallion (who is a sort of hero mentioned in the manual) and he hints at more quests to be done which of course never happened. I’ve included every screen from the endgame. You can also go after this back to the person who gave you the quest to get another item which would have been useful in KOL2 no doubt. I’m glad to have got the end anyway. Having cheated theres no sense of accomplishment here but at least I can move onto the next game which will hopefully be a bit better than this one.